Counselling can be many things but it is primarily known as a ‘talking therapy’ where the client and the counsellor take time to talk through problems or issues that the client may be experiencing. These issues can be widespread and range from anxieties about daily life and workplace occurrences, worries about finances or relationships, to more significant issues such as addictions (drug and alcohol being the more obvious ones) and bereavement; in fact it includes anything that may impact on how you, as a person, are affected by day-to-day living. Some people are sceptical about how talking to a complete stranger can help in these instances. There is no simple answer to these sceptics, except to say that I know it worked for me and for the many people who undergo counselling of any sort. The person who goes to see a counsellor must be willing to seek a change in their lives and be prepared to work at a solution or at least to work toward an understanding about what it is that has led to the distress. If you are not prepared to work on the issues at hand then counselling is unlikely to be of help. I will limit my writing here to individual counselling rather than extend it to couples or family counselling, although the same principles apply. 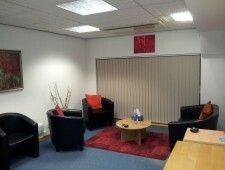 The counselling space is unique in that there are only two people present and confidentiality within the room is maintained at all times. There are some specific instances where this confidentiality may have to be broken but a counsellor will explain this in detail at the start of your time together. It is important for you to know that your identity will never be revealed without your express authority, such as in a letter to your GP or other professional. Trust is essential in order for honest disclosure to be made and this is where the ‘Therapeutic Relationship’ is formed. A counsellor and client will build this trust together, until the relationship is such that the client is able to talk about even the most personal of issues, knowing that they will not be judged, blamed or condemned. In this way an understanding of what has caused the problems being faced can be reached and then, by working together, a resolution may be achieved. A counsellor will not give advice but will help you to look at these issues differently and perhaps see that there is another way to deal with the problem that is causing you distress. Sometimes just talking about it is enough and at other times the counsellor may encourage a change in the way that you approach life, in order to achieve the necessary improvement. Counselling may take only a few weeks or, depending on the issues, many months or even years. Counselling can also be ‘time limited’, which means it is of short duration, because of a referral by a GP or other practitioner. At the end of this short period of therapy – normally six to ten weeks – you may then decide that you require further help; you could then choose to extend the time with the therapist yourself or to go elsewhere. At all times it is you who decides how long you want to be in therapy. The counsellor will help and advise in this, of course, but you will always have the final say as to whether or not to continue. It takes many years of training to become a counsellor and there are various alternative therapeutic approaches, each of which is suited to dealing with problems in different ways. Not all therapies look at your childhood history, for example; some deal only with the present. It is therefore good to be able to talk with a counsellor, prior to committing to therapy with them, in order to find out if their specific approach is suited to you. Of course, this may not always be straightforward and it may be necessary for you to try to work with more than one counsellor before you find the right person for you – one with whom you can build that essential relationship. Please ensure that whoever you decide to see for counselling is qualified and also a member of a recognised professional body such as BACP, UKCP or COSRT.